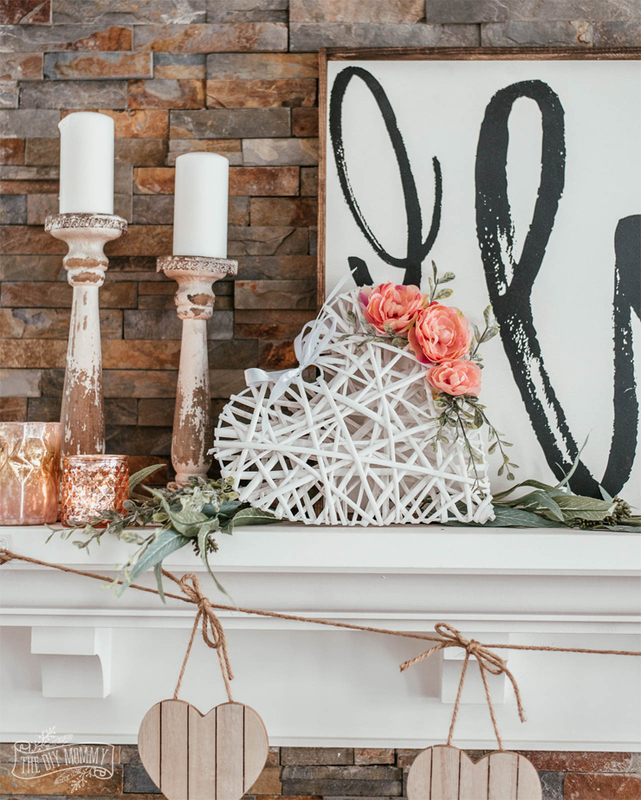 Get some simple ideas on how to decorate your home for Valentine’s Day in a soft and romantic way using items from the dollar store and easy DIY projects. 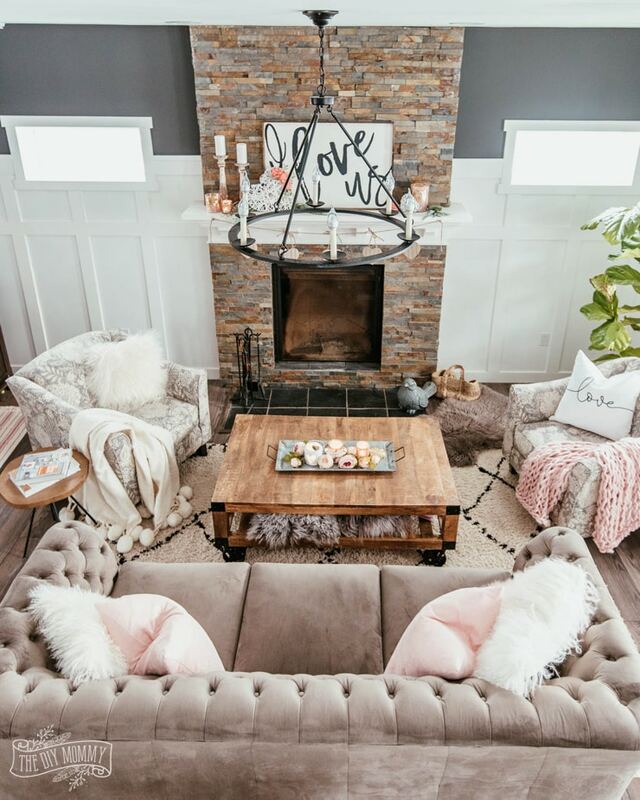 With Valentine’s Day approaching, my girls and I like to put out romantic little decor touches in our living room to celebrate. We don’t go all out for V-Day decorating, but a few items can go a long way! 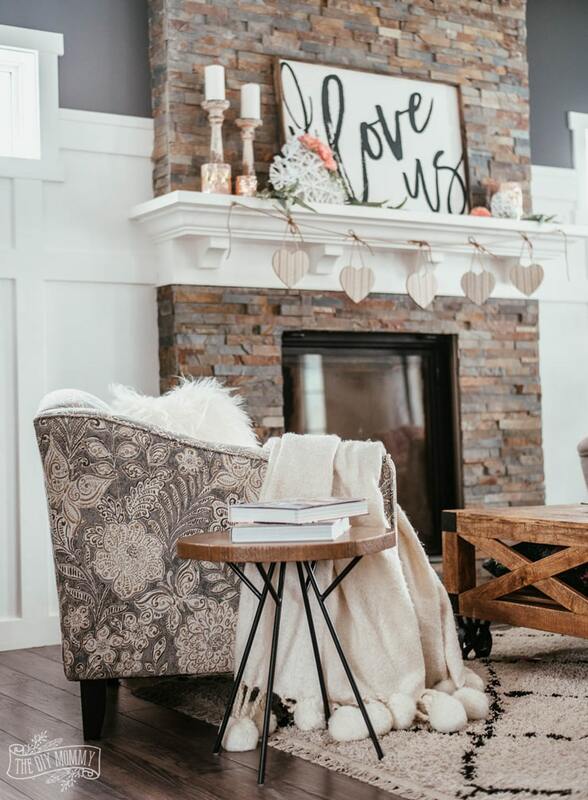 Here are some ideas that you can use to create a romantic vibe in your space this February, too. And you don’t need lots of money! 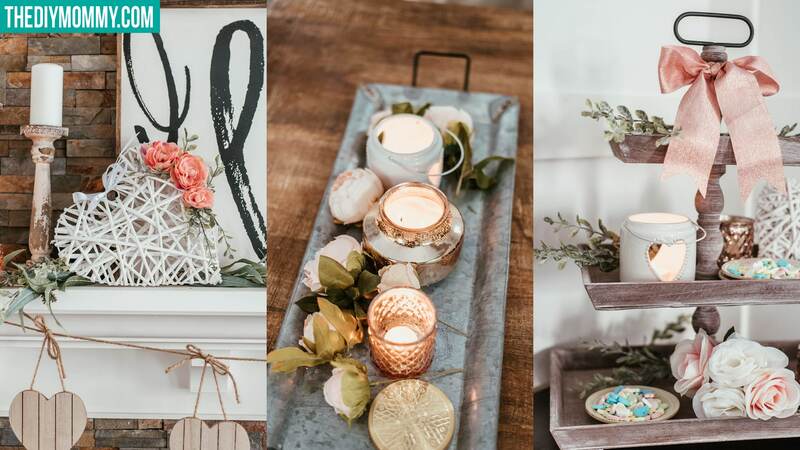 All of these are inexpensive DIYs that you can create on a budget. 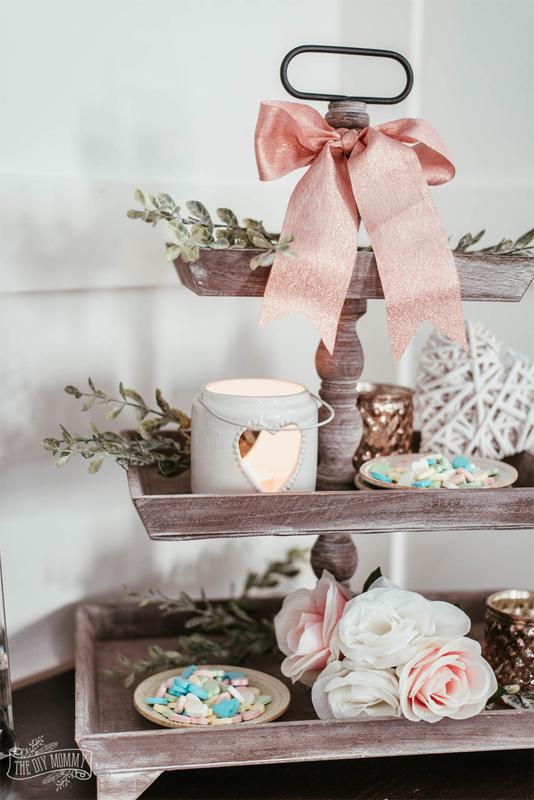 If you have a simple tiered tray like I do, you can decorate it for Valentine’s Day with ribbon, votive holders, faux flowers and heart candy from the dollar store. I only spent a few dollars to create a cute feature for our side table, and I’m loving the soft colour palette that can be carried into Spring. You can buy my Love pillow cover right here, or create a DIY version with a Cricut or printable iron-on. 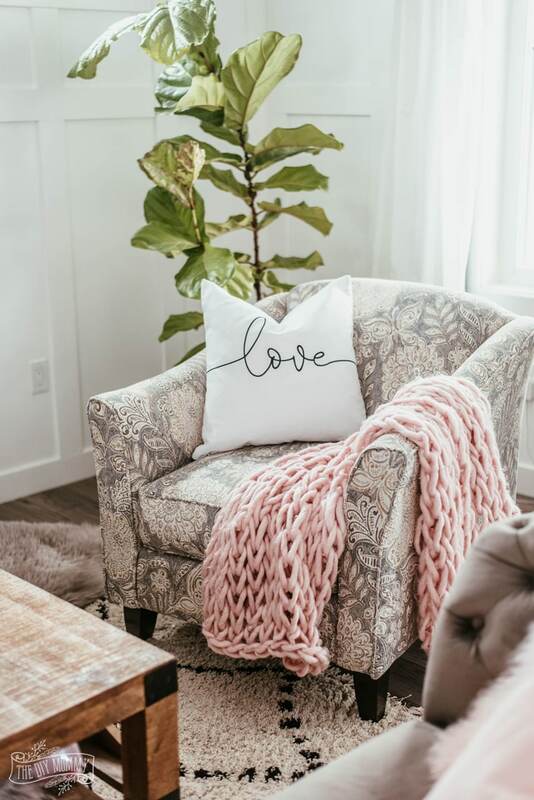 A soft arm knit blanket in a a lovely shade of blush pink works for Valentine’s Day and Spring. Learn how to make your own here! 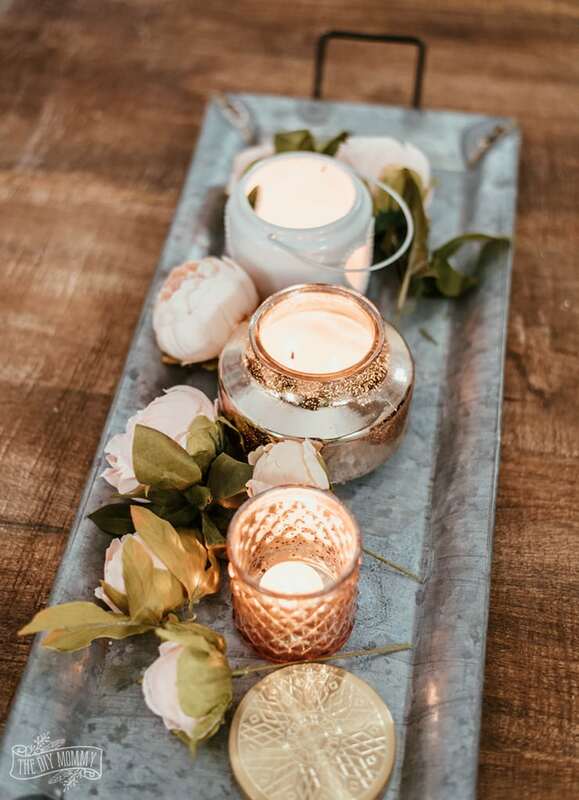 Rose gold mercury glass and ceramic heart votive holders from the dollar store make great centerpieces for coffee tables and dining tables. I mixed mine on a tray on our coffee table and added some faux flowers. I loved these wicker hearts in a couple of different sizes that I found at Dollarama this season! I embellished a larger one with inexpensive faux florals, and used the smaller ones on my tiered tray and mantel. I also found some adorable wooden heart plaques at Dollarama and tied them to some twine to create a rustic banner for our mantel. 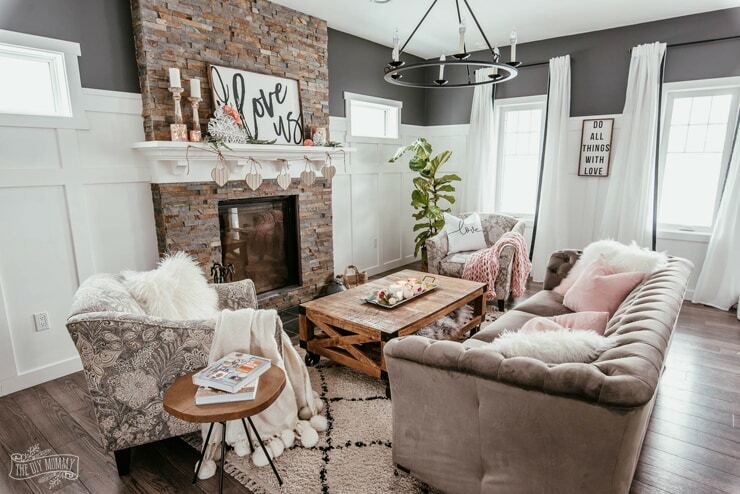 With a few simple DIY touches on a budget, our living room is cozy, romantic, and ready for Valentine’s Day! Now tell me: Do you decorate for Valentine’s Day? If so, how? I’d love to hear! Absolutely lovely, Christina! I’m so glad that you linked-up at Homestyle Gathering. I’m pinning this to my Valentine’s board! Hope you will come and link up again tomorrow! 😉 Hugs! Christina, where did you find that gorgeous tiered tray? It’s absolutely beautiful! Then add your amazing decor talent and it’s an absolute match made in heaven. Thank goodness I have your blog and YouTube channel for inspiration because I’m pretty sure my house would be naked without your creations.